Several months ago I put a link to a PDF of an easy-to-play transcription I made for string orchestra of the Pachelbel Canon on my thematic catalog blog, and I am rather astounded by the number of new people who go to it (and only it) every day. It is rare that I play a wedding that does not include the Pachelbel Canon as a processional (it is very useful as a processional because it can be tailored to fit any number of processing people). 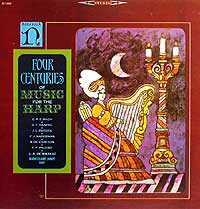 I imagine that many people think that it has been part of the wedding repertoire since it was written--a tradition as durable as wedding rings or wedding cake, but it first hit the public ear in 1968, when Jean Francois Paillard put the Canon on a Musical Heritage Society recording (MHS 1060). 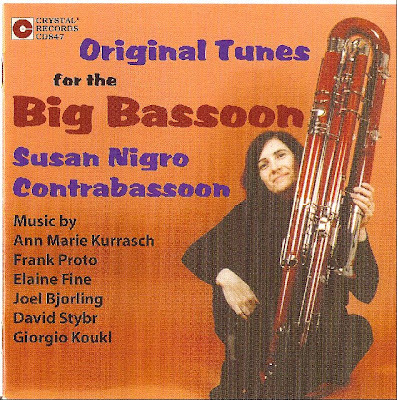 The performance was re-released on RCA (65468) and on Erato (98475). A few years ago (has it been ten already? ), I wrote an article about the Canon for the Listener's Guide to Classical Music, a source book about recordings, which (instead of repeating myself) I will quote. 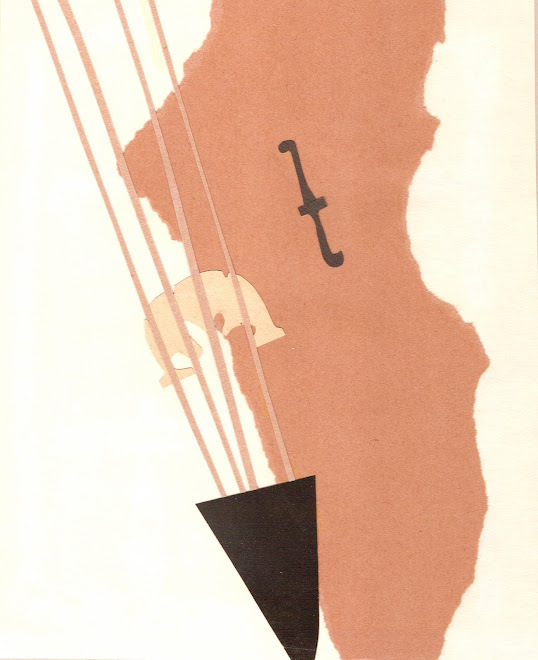 Paillard uses an edition by Kistner and Siegel and plays an arrangement that gives the three violin parts to three violin sections while a harpsichord provides a simple harmonic outline. An added viola section plays a pizzicato filler for most of the piece (near the end the violas finally play their ostinato figure with their bows--it is a very beautiful moment). In this orchestral arrangement the piece is expanded in length, and in order to maintain clarity with the added voices, the tempo is rather slow. He achieves wonderful dynamic and textural contrasts. Pachelbel was the teacher of Johann Christoph Bach (1671-1721), who was in turn the teacher of his brother Johann Sebastian Bach, and was one of the most important German composers of his time. His current representation on CD is limited to many recordings of his Canon and Gigue in D and only a few recordings of his other music. The remarkable canon was written in 1680 for three violins and continuo and has a two-measure bass line or "ground" that repeats 28 times during the 57-measure piece. It is written with one violin part that is played in canon by three violin voices that enter at two-measure intervals (when the bass begins its pattern again). The piece works very well as background music for events that require flexible amounts of time, like wedding processions and television commercials, because it can be resolved and stopped at any time. It also works as "pop" music because of its repetitions and the fact that it is instantly identifiable by its eight-note ground. After Karajan recorded it in 1970 for DGG, the Canon became even more popular, and the piece soon gained its permanent place on the top of the wedding charts. I remember the first time I heard it. It was at Tanglewood during an early afternoon of the early summer in the early 1970s. I heard it coming from the music shed through speakers (evidently someone on the shed's technical staff was testing out the audio system). I was transfixed by the piece, but I had no idea what it was. 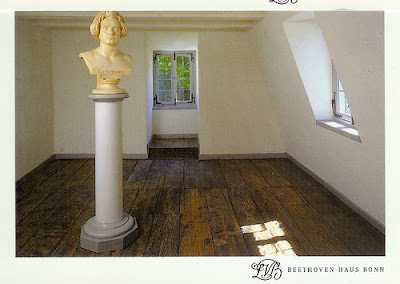 A few years later, in 1976 to be exact, in a fellow Juilliard students' apartment, I heard a recording of the Pachelbel Canon. It was my friend's "discovery," a piece he found on a Musical Heritage Recording, and he told me was that it was his favorite piece of music. 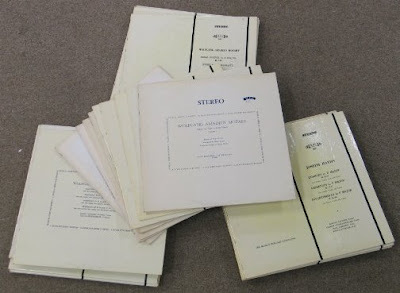 The Musical Heritage LPs, as you can see, were the dowdiest of the dowdy: mysterious European ensembles played baroque pieces that nobody ever heard of on white LP recordings with black lettering. The dowdy MHS covers might have been a reaction to the psychedelic covers that Nonesuch (another budget label) was using, or a reaction to the otherwise "hip" (not to be confused with HIP) covers that graced other labels, or it simply might have had something to do with money. There is nothing substandard about the Pachelbel Canon. It is a fine piece of music that I admire for its durability, usefulness, and simplicity. I can't help thinking, however, that in a more just musical world people would the Canon as a kind of gateway drug to the stunning catalog of Pachelbel's other works, many of which, in the ten years since the publication of the Morin Guide, have been recorded. I'm very proud of the arrangements I have done of this piece. You can find the arrangements for solo viola, solo violin, and solo cello through this link, the one for string quartet here, and the one for string orchestra here. Perhaps the worst fear that any creative person has is the fear of repeating herself. Or repeating himself. Perhaps at any given stage of life we all have only so much to say. Or maybe it's just me. I spent the last ten years in a whirlwind of creative activity. I could barely keep up with myself. All my inspiration seemed to come from inside, and new music poured out of me, regardless of whether anyone was interested in playing it. I got inspiration from everyone and everything, and writing music served, in part, as a way of coping with the isolation that I so often feel as a result of the limited contact I have with what I perceive to be the great musical world at large. Lately I have come to realize that nobody can really be creative in a vacuum, and there is only a limited amount of self-stimulation that any given person can fabricate. Like any other group of creative people, composers need to know that we are wanted and needed; but I guess for the most part, we are not. There is far more music being written than will ever be played. I had a brush with the 21st-century commercial musical world last week. I went (as a guest of a friend of a friend) to a huge musical-industrial convention, and I spent an hour or so roaming through the booths of vendors who were displaying their musical wares. I didn't know where to begin, so I simply did not begin. Intimidation set in, and I left the convention with the realization that the 21st-century musical marketplace has very little to do with my musical world. Heading towards my conventional destination on the train (and I love traveling by train) I read a large chunk of Charles Ives' Memos, which I hadn't previously read. When I was a teenager Charles Ives, along with Brahms and Bach, was my favorite composer. Reading his curmudgeonly (and often blog-like) writings, I once again became excited about the idea of living in a musical world on the outside of convention and expectation. But then I realized that one of the major problems composers face in this new century is that the very musical expression that is "outside of convention" has become convention. The act of trying to write something that is even a little bit meaningful so often gets mangled with gimmickry or with "process." Perhaps this public statement (read perhaps by dozens of people) will help me to get out of my current state of musical funk. Maybe it won't. I will leave you with an exchange between Charles Ives and Elizabeth Sprague Coolidge, who grew up to be a kind of "godmother" of new music. Harmony Ives, who was married to Charles, was the niece of Elizabeth Sprague Coolidge's father, which would make her Elizabeth Sprague Coolidge's first cousin. Either in he summer of 1913 or 1914, Mr. Sprague (Harmony's Uncle Albert) and Mrs. Sprague, with the daughter, Mrs. Coolidge, stopped to see us at Redding on their way to Pittsfield. After dinner (before going) daughter says to writer, "Are you still keeping up your music?" Writer says, "Well, yes." So former asks writer to play some of it, and came to the little room with the piano, behind the dining room. I happened to have on the piano the score or the sketch of the Black March (The St. Gaudens). I started to play a little of this--daughter's face grew sour. "Do you like those awful sounds?" she said. So I stopped and played something that I thought might be a little less rough on her, which was the first part of Washington's Birthday. That made her walk out of the room. In getting into the car, headed toward Pittsfield, she said, "Well, I must say your music makes no sense to me. It is not, to my mind, music. How is that--studying as you have with Parker--that you ever came to write like that? You ought to know the music of Daniel Gregory Mason, who is living near us in Pittsfield--he has a real message. Good-bye!" I can't recall Frau Schultz's first name, but I'll never forget the afternoon in September when she invited me to her house to help make Christmas Cookies. Now, I admit, I'm not much of a Christmas person, but I have very fond memories attached to the Christmas I spent in Schladming, Austria in 1981. Frau Schultz taught recorder and accordion in the Stadtmusikschule Schladming. She was the senior member of the faculty, with so much experience that she could identify wrapped Christmas presents that the students would give to their teachers. She insisted that all the teachers in the school have a coffee pause put into their schedule, and she always made the coffee and brought the treats, which she often baked. Frau Schultz, who had grown children who had moved away, was always very maternal towards me. When I came to her house to make Christmas cookies, I was given a huge bowl of hazelnuts and a mechanical device used to crack them. We cracked the hazelnuts, and then ground them into a meal. We mixed them with the other mystery ingredients to make the teig. I had never cooked in Austrian before: everything was measured by weight and not by volume. After everything was mixed together, we put the dough into a container, and Frau Schultz brought it down to her basement to cure for what I imagine would be a few months. I imagine that Schladming was a town very much like the town where "Silent Night" was written, especially at night, and especially in the winter. Unlike the glittering lights of American Christmastime, there was a softness and a lightness to the Austrian celebration. For an officially Catholic country, the celebrations in Schladming were remarkably secular; and they were filled with remarkable food. Everything was quiet that Christmas, and really kind of magical. The only thing that this recipe has to do with music is the fact that beans are considered by some to be the musical fruit. The "fantastic" part of this recipe came from grabbing the wrong can. Cook the onion and garlic in the oil for a few minutes, and then add the chopped green pepper. Cook it for a minute or two. Add the chopped chipotle peppers, and cook for another minute or so, until the liquid around the onions and peppers looks a little pink. Add the rest of the ingredients, cover, and simmer for 10-20 minutes. Take the cover off, stir it up, and cook it uncovered for a couple of minutes, and serve. I guess you could use other tomatoes and other pizza sauce, but nothing comes close in taste to Dei Fratelli. Heck, you could even use ground beef as a meat substitute substitute. Finally an entity in the financial sector is trying to do something to help struggling school music programs! FutureStage was created to help empower under-served high school students by funding educational opportunities in the performing arts. This year, MMB has worked with FutureStage to create a holiday focused, free e-card that is fun, timely, and features some great classical-music elements the audience from Musical Assumptions might enjoy. These electronic cards are designed so that for each one sent, Fidelity gives a donation. More, each holiday ecard features music provided by and distributed on behalf of select regional orchestras. For every ecard sent, Fidelity Investments will donate another $1 to buy new musical instruments for students in under-served schools in the same area as that orchestra. I think it is a great idea, which is why I'm sharing it here. Charles Ives Singing "They are There"
This is a WWI protest song that still rings true. In a world where all will have a say. Brave boys are now in action! They are there, they are there, they are there! As the Allies beat up all the war hogs. For it's rally round the flag of the People's New Free World, shouting the battle cry of freedom! When they'll smash all dictators to the wall! Let's build a people's world nation, hooray! They'll be there, they'll be there, they'll be there! In these dark days of winter there is really nothing quite as snug as a dowdy song. Let's see what we can find on line to share during the sweatpants and slippers days when we all turn a little bit inward and enjoy the comforts of home, when we can. Please feel free to grab a cup of cocoa and indulge. Richard Tauber singing Love's Old Sweet Song from Michael. The Charlie Rose interview I just saw this evening with Elliot Carter, James Levine, and Daniel Barenboim is available on line. I don't know if I have ever enjoyed a television program as much as I enjoyed this one. I have always preferred Carter's early music to his later music (I love his woodwind quintet, and I especially love his Eight Etudes and Fantasy for woodwind quartet), but hearing him speak about his newest work has really piqued my curiosity. Artists Corps? Sign me up! Barack Obama is planning to have classical music performances at the White House, and, according to Clef Notes, his National Arts Policy Committee suggests an "Artists Corps" to work with students in low income areas. I have always considered it a personal obligation to do what I can in my community to help introduce people to classical music. I have found that adults can sometimes resist, but if you catch people when they are young enough, and you don't require them to have talent in order to participate in the process of discovering it, classical music can be a comfort, a source of stimulation, and a life long passion. If anyone from this incipient "Artists Corps" finds her or his way to this blog, drop me a note and let me know how to sign up. A few years ago our son and his friend made a short (30 second) advertisement as part of a YouTube contest for Heinz Ketchup. You can see his entry here. It seems to have been seen by 364 people since it first went up. We all followed the contest closely, watching hour upon hour of 30-second video ads about catsup (and I imagine that 100 of those 364 views came from my household and the household of our son's project partner). Like all contests there is one winner. The winner of the Heinz contest was Heinz: if they did air the winning ad on television, I didn't see it, but the company got the winning ad at a bargain rate because they didn't have to pay a professional price for it. And for a while, Heinz was on the public's mind, which is what promotion is all about. Like all promotional projects, the YouTube Symphony Orchestra contest serves to promote a product, and in this case the products are Tan Dun, Michael Tilson Thomas, and Carnegie Hall. There is already more buzz about this project than any concert in recent memory. The public relations machine has really done its job, but, as I said above, it does little for the advancement of music or musicians, really. There will be 100 "winners," and I'm afraid that the thousands of people who are not winners will really feel like losers. We can't really afford that kind of win-lose situation with music because music is a totally different kind of game: it is the kind you play to play, not to win. This project even got a mention on the popular culture section of the Rachel Maddow show, where Rachel and her popular culture adviser made fun of the idea of having classical music connected with YouTube. I guess they don't have a clue about the absolute treasure trove YouTube is for classical musicians and people who enjoy listening to classical music. I applaud what YouTube is able to do for classical musicians and for classical music, but you are not going to see me playing any part in this on-line orchestra. You could knock me over with a feather right now. 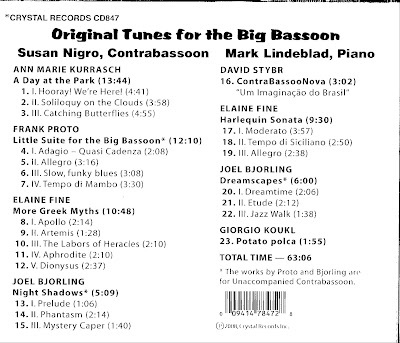 This recording of Susan Nigro and Mark Lindeblad playing two pieces of mine for contrabassoon and piano just came in today's mail. I am one happy composer listening to this recording. I thought that I'd share my moment of suspended bliss in the very, very, very low register here. Now that I have made my contribution to the commercial world of recorded music, I'll even make a link to a place where you can buy the recording!